Majority of computer users install Adobe Acrobat Reader software on their PC to add support for opening PDF files. This single Adobe software can result in irritating pop-up reminders and automatic download window emerging after every few days. Do you want to get rid of this update window and disable auto updates? 1. Goto Start > Programs > Adobe Acrobat & open the program. 2. Goto Edit > Preferences (or press Ctrl+K) to open Preferences window. 3. Click “Updater” option on the left side. 4. 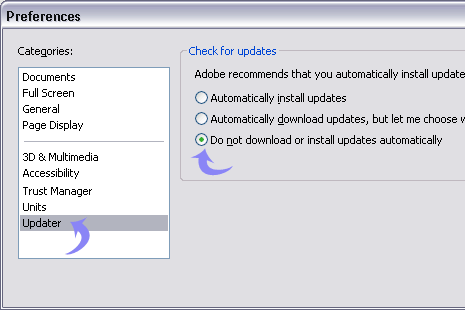 Select the last option “Do not download or install updated automatically”. 5. Click OK and close Adobe Acrobat Reader program. This should make Techno Life easy without irritating auto updates window. If you still get Adobe update window, check for settings in any other Adobe software installed on the computer. Font Preview any Text Online / Offline, Damn Easy !